Every Labor Day, millions of people gather in Brooklyn to celebrate Caribbean culture at the West Indian-American Day Carnival. 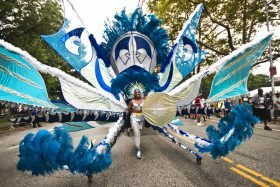 Since the early 20th century, the Carnival, which first got its start in the United States in Harlem, has brought together New Yorkers through beautiful costumes, music, dance and food of the West Indies. Starting in the 1960s, the festival has taken over Crown Heights‘ Eastern Parkway, uniting many islands (Trinidad and Tobago, Barbados, Haiti, Dominica, Saint Lucia, Jamaica, Saint Vincent and Grenda, Guyana, Suriname and Belize and others) through one extravagant party. As one of New York City’s largest, and certainly most colorful, events, the Carnival should not be missed. Ahead, learn about the history of the parade, the traditions that thrive to this day and the details of this year’s festival. Though Labor Day has been embraced as a national holiday–albeit one many Americans don’t know the history of–it originated right here in New York City. The holiday is a result of the city’s labor unions fighting for worker’s rights throughout the 1800’s. 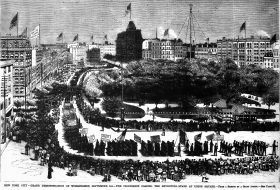 The event was first observed, unofficially, on Tuesday, September 5th, 1882, with thousands marching from City Hall up to Union Square. At the time, the New York Times considered the event to be unremarkable. But 135 years later, we celebrate Labor Day on the first Monday of every September as a tribute to all American workers. It’s also a good opportunity to recognize the hard-won accomplishments of New York unions to secure a better workplace for us today.